Pol Cousineau is the charming, spiritual and humble President of a little American company called The Digital Navigator. Pol’s an expert in pretty much everything to do with selling your coaching online because he’s trained with the best online marketers. On top of that being a Canadian CPA Auditor licensed in Quebec, makes him a total wiz at interpreting the data and stats that sit beneath the surface of our business websites. He easily sees stories in your data that just look like a bunch of numbers to the average person. In this interview Pol and I were specifically looking for Pol to teach us Coaches how to get leads organically from Google. It’s something he helped me and my team with in 2018 and I was so impressed with the strategy (AND the fact that you can get more ongoing ‘FREE’ leads with not too much effort) that I thought it would be good to share the love. I can tell you that he delivered the goods and shared specific action items you can use to grow your coaching business – prepare to be inspired! Benay: Good day. This is Benay Dyor and welcome to another episode of Coach Pep Talk, the podcast for people who run their own coaching businesses. Each week I talk to an expert who shares wisdom that helps us be better coaches and better coaching business owners. 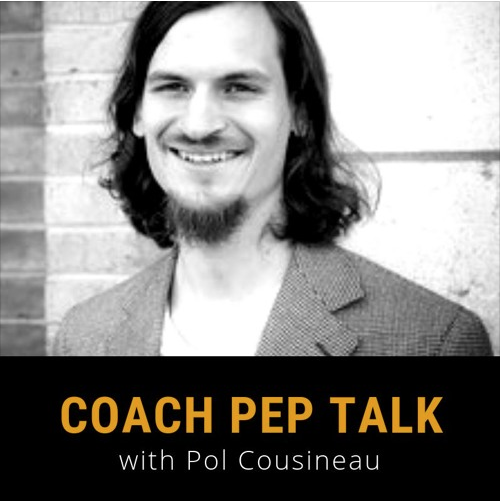 This week I’ve got Pol Cousineau on the line and he’s talking to us about how we can get targeted coaching leads from Google with our online content. Awesome Interview. I’ll see you on the other side. Benay: Coach Pep Talk is proudly brought to you by Life Coach Office an online service that lets you easily manage your coaching business from just one platform. Some of the features that our clients really love are the ability to manage your client files all in one place, the ability to easily send invoices, and manage your coaching calendar. But the one that takes the, it’s the icing on the cake, is really the ability to set up your own membership site with just a few clicks of a few buttons and have your own online classroom just ready to go in about 10 minutes. So if you think Life Coach Office sounds pretty interesting, the best way to see if it’s gonna be a good fit for your business is to jump on over to our website and sign up for the free trial. You can do that at lifecoachoffice.com. Benay: I’d like to introduce you to our guest for today Pol Cousineau. He is a CPA auditor in Quebec, is the president of The Digital Navigator, and is a specialist in creating learning marketing and sales platforms for digital content. He’s also, and get this list, a direct response copywriting specialist, customer value optimization specialist, a conversion rate optimization specialist, an e-commerce specialist, and an email marketing specialist certified by Digital Marketer. In addition to using the Ask Method 2.0 formula to build a personalized experience for clients and visitors. Now if that isn’t a mouthful I don’t know it is. What impressed me most by about Pol when I first met him was his sort of like a hippy, relaxed, alternative streak that is like juxtapose with this hard line data auditor kind of expertise. And I know you’re going to love him too. So let’s hear what he has to say about how we can make Google work for our coaching business and bring us more leads. Benay: Hello Pol and welcome to the show. Pol: Hi Benay! I’m happy to be here with you and your listeners. Benay: Me too. You have just blown my mind with your technical expertise in the whole Google landscape and I’ve been very excited to get you on the show ever since the first day we met, which is about. I don’t know, it was a long time ago, six months, a year or maybe. Anyway so let’s get straight into it. And I just want to kick off by asking you why do you think Google is something that we as coaches really need to be paying attention to? Pol: Well one of the reasons is as a coach you’re surely already creating some content and that content can either have a life that’s very short, think about a Facebook post, or it can have a life that’s rather long. So think about years of that content bringing you prospects and people to your business. With Google it’s actually going to be building you organic traffic, which is people that are going to be searching for you or your services, and that’s in the search engines and then they’re going to be coming back one year, two year, three year, five year, ten years from now if you do it well. So it’s really a way of working smartly and also building a coaching business that has value. If later on you want to grow a team, you want to sell it, or you just don’t want to run ads anymore. Benay: So I like to look at content as kind of like creating a good piece of content is like having an asset, almost like an asset that’s giving back to you. You know like you build this is a great piece of content once and then it keeps bringing new leads, new interest to you. So OK. So that really sets a good scene. So for the listeners who are really new to this stuff, and some listeners will be very advanced and some people will be brand new, but I wanted to sort of level the playing field. Can we just take a step back and define some of the key concepts that sit within the Google ecosystem? So what are the what are the components that we really need to be aware of and understand? If you can just kind of define those so that where we’re all on the same page? Pol: Sure. So normally when you think of Google there’s two categories of traffic. So there’s the organic traffic, and that’s the one that when you enter a search term in the search engine literally on Google.com and then that would bring up different pages. People click and they end up on your site. That would be organic traffic. The other one is page traffic, which would be when you’re using Google ads. And then you pay for a certain amount of clicks and they display you, and it’s literally going to see ads on your link, and then every time people click or it gets displayed, they’re going to be paying a certain amount of money. So understanding that there’s these two worlds is very important. Pol: Then there’s the search engine, which is where when you enter those terms you’re going to see the paid as well as the organic listings. Benay: And what about content? When you talk about content and as we proceed talking about content, are there different types of content that coaches should be aware of? Pol: Totally. So one of them is the audio content of this podcast. Right? So this would be one type of content that you can place on your website, but you can also place it on external properties meaning iTunes, Stitchers, and there is like many other podcasting platforms. So that’s one type of content that you could create is that audio. The other one that’s very popular is video content. You can think of YouTube as the main engine for that and then you would be publishing it there and then ideally have a link back to your website. Then you have the written content. And that’s what people normally think of as a blog. You read that article and it has a lot of information and interesting images. Now, what’s really cool is that you can embed, which includes a video, or an audio, or your podcast on a blog and then add a transcript, or a high level summary and then double dip on your content. Benay: Yeah that’s something that I do. I have a YouTube channel and then of course this podcast. The podcast is on iTunes and SoundCloud currently and but in the in our blog we will always make a new post with each podcast release and then every time I do a video on YouTube we make a post that has that video on it. So is that kind of, are we on the right track with that? Pol: Yes, we are. That’s the best way to do it and that’s why like Google for coaches is about working smartly. Because you’re already producing contents or assets, so let’s find a way where it gives you maximum leverage. Great category. A bigger category of content is external content, meaning a guest appearance on someone’s blog, someone’s YouTube, or a podcast just like I’m doing right now on your podcast, and then hopefully you will bench it by website or you have a link on your website that goes back to mine. It helps give me authority and credibility with Google, which is actually helping me rank. So you’re winning and I’m winning. Benay: That’s great. OK so can we talk a little bit about Google ranking and what does Google like? Pol: Well Google is pretty crazy. So it can be very intimidating when you get started. I mean it does get really technical, but the good news is with the fundamentals you can apply this in your coaching business right away. So normally what you would do is that, let’s say you’re searching for a fitness coach, or health coaching, or maybe you’re looking at about how to save up for my dream vacation. That might be a term that you would enter in Google. Now you’re not necessarily looking for a coach that will help you with your budget, but a coach that is you know very skilled in finances could actually help you with that search query, which is how do I save up for my dream vacation. So all of these search terms are very specific. And then what Google does is it tries to provide the most relevant information to the people, the person that’s searching because the Google is client is the searcher so then they will evaluate the content, how accurate it is and how it responds to that search term and they’ll also see what is the reputation of the person giving out that advice, which is where external links comes into play. And then the higher your and the quality of your content is and then the higher your reputation, the more likely you are to rank for that third. And then there are specific tools that you can use to see where your ranking. Or you could literally punch in that term and then try to cycle through the pages and find where you’re at. But that would get, that would be very lengthy. Benay: Yeah. OK. So we’re already getting there. So let’s. Because I mean this whole this whole interview is all about how do we get a targeted coaching lead from Google with our content. So do you have some steps, or a process, how are we going to, how are you gonna help us deconstruct this and make some headway in our coaching business? Pol: Well first I want to make sure that you know it does not involve creating mountains and mountains of content. You could have two or three solid pieces of content on your website and that could be sufficient to bring you targeted coaching leads from Google. So this is good news. Benay: That is good news! Yeah, because that kind of goes against some of the trends. I mean, people say you have to publish you know every day, or you have to publish three times a day or at least every week. So that is, that’s a relief for me. Thank you. Pol: So then at the first step is if you already have content. Let’s say that you have several pages on your website is to see if any of those are already ranking or close to ranking on page one Google. Page one Google means position 1 to 10. That’s important because most people searching won’t go to page five to find the answer. I mean I don’t remember the last time I went that far on Google. So you really want to be on page one. Benay: Yeah. I don’t think I ever go past page one. Pol: Well that’s because it doesn’t, it doesn’t feel like it’s going to be relevant right? Pol: So when you look on your website, if you have Google Analytics installed. You can easily click on that and then you can see an overview of some of your top pages. Now I won’t go into the details of Google Analytics. You could just Google it and say, ‘How to see my top pages on Google Analytics’. Benay: Multiple videos on it. Pol: Google will have the most accurate answers for that, they will show you the steps to do that. You want to have pages that are already bringing people in. Now the second step would be to see if you have pages that are ranking position number 11 to 20, which is page two of Google. Because that’s going to be a low hanging fruit. You’re almost there. So why start from scratch. To figure that one out, there are professional tools that are available to you. Benay: So you can’t find that out just on Google Analytics? Pol: Well what you could do if you want to take Google Analytics, and which is a good question, is that you would maybe look at your top 10 pages for your traffic and then you could enter a few different search terms that would be related to those pages in Google, and then see where you’re at. Like are you finding yourself if you browse to page two your page three? That would be a good reason to actually go past page one. And then you could do that manually for a few different terms that you think you might be ranking for and then see where it’s at. There is the Google AdWords, which is a paid platform that allows you to search for terms there. But it’s not very accurate and it doesn’t give you a good idea of the competition and the volume. So although that is a free way I would not recommend to use that one. So it really would be Google Analytics and then doing that elbow grease, you know entering the words or those other tools. Benay: OK. So hold on let me just let me just stop there. So what we’ve done is we’ve gone into we’ve installed Google Analytics and from there we found the pages that we’re ranking one, where we’re on page 1 to 10 in Google. And I sort of assumed from what we’re talking about that those would be really good articles to maybe extend or add to so that they get even more authority and more higher ranking in Google? Is that a… Am I on the right track there? Pol: And the ones that have traffic then you want to see where your position. And that will involve just cycling through the different pages on Google after entering some search terms. Benay: OK. OK. So I guess for some coaches they’re going to hit the jackpot because they’re going to have some content that’s already on page one to 10. And for people who maybe are newer and they don’t have that kind of traction yet in Google, then they want to see where they are, if they’re anywhere? Is that it? Am I hearing that right? OK cool. OK. And then so once they’ve kind of I guess chosen the asset that they’re going to really work on, or some people maybe are starting from ground zero and they have nothing and then they’ll be creating content from scratch. So can I… Is It safe to say that we’ve kind of got these three positions? So a coach that’s going to have pages in one to 10, a coach that’s going to have pages in 11 to 20, and a coach is going to have nothing because they don’t even have their website? Is that where we’re going or have I missed a? Pol: Yeah. And I would say its position one to 10, or position eleven to 20. Pol: Which would be page one and page two. So there are normally 10 search results per pages. Pol: If you on page ten, that’s a hundred, that’s a lot of work. Benay: That’s a lot of words. Yeah. OK. OK. So cool. So we’ve got coaches who are on page 1 or 2, and that’s in the first 10 results the first 10 entries which you have 10 per pages that what you said? Benay: OK. So they’re going to be on page one, or we’re gonna have coaches who are gonna be on page two, or we are gonna have coaches who’ve been writing content and they’re not ranked…they’re off, they’re page three and beyond. Benay: OK. Or we’re gonna have coaches who haven’t put their website together yet. And they’re gonna start creating content from the beginning. So we’ve got four positions then? Is that a fair assessment? Pol: Yeah, but I would put position number three and position number four in one. So if you’re not ranking anywhere or you don’t have a website the exercise will be the same for you as far as ranking on Google and getting those leads. Benay: OK. OK. Cool. And just to clarify for the coaches were like, ‘Oh wow, ok I really want to understand if I’m on page one or not.’ So you can understand if you’re on page one by going into Analytics and then to understand if you’re on page two, three and beyond you need to do that… It sounds like it’s a really manual process can you just elaborate on that just a little bit more? If anybody missed like how to figure out what page they’re on if they’re not on page one? Pol: Yes. And I’ll give you an inexpensive shortcut as well. Benay: Cool! We like those! Pol: Right? So If you’re just using Google Analytics, you would still want to find your top 10 pages and then you would enter search terms for which you’re providing the answers on those pages. So let’s say that you’re a coach that’s in the fitness industry and you have an article that’s a ranking highly about the Paleo diet, then you would enter different search terms in Google that would be asking questions around that. And then you would start cycling, you would say page two, page three at the bottom, page four, and then you would scroll and then you look if you can find your article in there. Pol: That would know the labor intensive way. Pol: Now here’s the shortcut. It is a paid tool, but they do have a free… Not a free trial but a little trial, it’s called ahrefs. And that would be A H R E F S, F as in Frank. And that tool they have a seven-day trial for seven dollars. After that it’s ninety-seven dollars per month. At least at the time of this recording. But you could actually do all your planning work in that first week of your seven dollars. That’s why I said it’s like a shortcut. It’s not going to require massive investment. Pol: What happens in ahrefs is that you can enter the address of your website and then you can see in that tool all the keywords that you’re ranking for and then the position that you have, which are your most targeted content pages. Like your highest ranking ones. You can also enter a search query and then see everyone that’s ranking for that search term. Benay: Wow. OK. That’s really powerful stuff. OK. So this is going to arm coaches in that seven-day trial period to really get their head around how their content is performing in Google. Pol: Yes. And then that’ll move us in to the next step which is planning your actual content so that it ranks. Benay: OK so let’s talk about that. Sounds awesome. Pol: So let’s use an example which is a blog article. Now you can do this by video and then use the same approach. But I think a blog is very easy for people to understand the written format. So what you’re going to want to do is a use a tool like ahrefs, like I mentioned during that seven-day trial period, and then you’re going to enter a bunch of search terms that are related to your coaching niche. So it could be all fitness related terms. If you’re coaching in the financial space it could be a lot of different financial terms. Just to stay consistent with those examples. And you just go at it, like don’t hold your creativity because people could be searching for really weird things. So you just want to enter a bunch of them. You can also jot that down on a note pad if it makes it easier before entering it on the tool because sometimes entering in a computer stifles our creativity. Benay: Can you give us an example of a crazy thing before you go onto then, that you’ve seen that you’re like, ‘Oh my gosh I never would have guessed that.’ Does anything come to mind? Benay: A really random one? Pol: Well there was one that…Oh Yeah! Well actually one of my clients does controlled remote viewing and then I don’t think it would be that crazy, but it was kind of crazy, where you had a learning controlled remote viewing for beginners. That’s a long search query. Like that’s a lot of words. And then there was roughly 50 to 70 people every single month searching for that exactly. Pol: And I thought that was quite unusual, that there would be that many people searching for that. Benay: Yeah. Because it’s a long phrase. OK, cool. So be creative. You can have long terms as well? Pol: Long terms tend to be a good starting point if you’re in category 3 and 4, meaning you’re not ranking yet or you don’t have a website because they’re lower difficulty most of the times. So going back to that example of learning controlled remote viewing for beginners, the difficulty rating of that was like zero or one out of 100. Meaning that there’s not a lot of content published targeting that. There’s not a lot of links created in authority around it. So you could easily steal that spot and then gain that targeted traffic. And the longer the search term, normally the more motivated the person is. Benay: Yeah. So that’s gonna be a very high quality lead. I mean chances are good. Yeah. Benay: Awesome! So You can jump in and all the sudden go from zero to having 50 to 60 leads on, if you if you find that right term per month. Pol: Yeah. And then that’s where you’re going to show in the search results. Let’s say on your on page one you can expect to have maybe 10 to 40 percent of that traffic. So then, you know I’m going on a rough number here, let’s say you would get twenty-five targeted leads out of those 50 to 70 every month. And then as long as your article is of high quality then you’ll have new people coming every month. And what’s really cool with Google is that most of the time those are new leads. Just think about it yourself. How often would you write the same search in Google every single month. No, we don’t do that. Pol: So for you that means that that’s new people that are going to be seeing your coaching business and its new opportunities that are going to come every single month. So let’s go back to the framework of that article. So your first goal will be to find a keyword that has a sufficient volume of traffic but that has an extremely low difficulty rating. And tools like ahrefs will show you that. The Google AdWords tool has a way that you can find it but it’s not precise. So that one is free let’s say you’re out of your trial period. Or there’s other tools like SDM Rush that does something similar. That’s another tool. So regardless of your tool, they always tell you the difficulty rating and you want to hit something that’s very very low, meaning almost no competition. Benay: OK so what a difficult rating, can it be from 1 to 10, or can you just talk a little bit more about that? Pol: So each tool is different, but if you hover over the difficulty rating, it only tells you how the scale works. With ahrefs I tend to think if it’s like from zero to 10 or 12, it’s very easy. Then from that 10, 12 to about 25, 30, it’s medium difficulty. And then over that would start to be very difficult. Pol: If you’re not ranking on anything, pick something with a difficulty rating of 10 or less. Like go for a really low hanging fruit. If you’ve been around the block for several years and you’ve got that credibility and you’ve got a lot of keywords already, then you may want to grab one of the high ratings you know would have been more difficult. Benay: Okay. Okay cool. All right. So now that we’ve got our terms, we’ve chosen one that’s got a low difficulty rating, what’s the next step? Pol: So then that will be the title of your article. Benay: Ah, the search term! Pol: Yes. And you would want to answer that. So I mean it has to read, like it makes sense right for someone who they see that because if you get them on your page but you’re writing for a robot, it won’t necessarily become a lead. You got to get them interested. So you want to answer that search term if possible as is, in the title of your article and that would also be the URL that you would be on your website. Benay: And why do you want it to be that URL also? Like why is that important? Pol: Yeah. It gives more indicators to Google that this relates to that specific search term. So most of the time, none of these are absolutes, you can deviate a little bit from it, but every little piece gives you more points. And if you’re starting in your article well why wouldn’t you take the easiest route? Benay: Exactly. I like your style, Pol. OK cool. So we’ve got, we’ve found our search term, it’s the low difficulty, we’ve used it as our title, we’ve put the same description or the same search term in our URL. Then what? Pol: Then you’re going to want to identify the sub headers or the sub topics in that article. So let’s say that we pick ‘How to learn to control remote viewing for beginners’ as the title of our article, then there are may be three or four points that you would want to expand on that. One could be remote viewing tests, like you would want to be able to test your abilities of doing the remote viewing. Now you would enter that in that tool again and then make sure that there is actual search traffic for it. So let’s say you find out that there’s about 30 people every month that search for that, great, maybe there is a 100 even better. So you want to determine what are going to be those sub points you are gonna be writing about and then make sure that people are searching for it and then that will create the outline for your article. And having like three is generally sufficient. But you could go up to a dozen points if you really feel compelled to. Benay: Right. And so these are your all they are sub headers are also search terms that are in this topic space. Is that right? Pol: Yeah. And your goal will be to build kind of like a spider web. Because when we’re searching for something, and just think about your behavior as you’re listening to this, you might not be satisfied with the information that you find on Google or you might have additional questions about that. So then you would punch in additional search terms. And Google is very intelligent. So now it’s starting to understand what are the related search terms. So if you’re able to hit on several of them, then you’re telling Google, this is a very relevant resource for people that are searching for this and then they want to rank you because of that. Benay: Yeah. Great. That’s a great tip. I mean just so I can just imagine if all of my coaching clients wrote their blog posts like this. I mean it would save lots of money in advertising because you’d get, I mean it’s just sort of being strategic rather than just feeling like I’ve got to put out content. I’ve got to put out content. Which is a lot of the energy that I feel behind blog writing at the moment. It’s more like you have to do it rather than focusing on a real strategic asset that’s going to keep giving back to you over and over over the years. It’s phenomenal. Thanks Pol. Pol: Well normally people that put out content, like let’s say every week, will keep their existing audience engaged. Not necessarily to bring in new leads. Because the people that are coming back every week, those are the same people. And right now we’re focusing on really bringing those targeted coaching leads which are you and new searchers, new visitors to your website every month. And that’s the beauty of this method because with two or three articles you could easily have 100 to 200 new leads arriving at your website every month and you wouldn’t even need to publish anything for the rest of the year if you don’t want to. Benay: That’s pretty awesome. I like that strategy. I think it’s great. I mean who…even though even the coaches who are you know putting out content to keep their current audience engaged surely they also want new visitors as well. Pol: And here’s a tip for those coaches, is to then, that ongoing content, make it all of those related search terms that we were seeing earlier. So instead of having as sub topics in an article you could be meaty articles and then you would put a link back to your primary article in each of those ones, so you’re still sending that signal to Google saying that hey these seven weekly publications they’re actually all related to controlled remote viewing. Benay: Got it. OK. So let me, can I just repeat that back to make sure that I’ve got that concept? So we were talking about creating this really rich asset right, where we’ve chosen a low difficulty search term and we’ve used that as the title, and then we’ve looked at related search terms and using those as our sub headers. Now for people who want to put out content more frequently and they don’t want to have this big massive post they could actually have a shorter post answering that question and then create additional pieces of content use…instead of them being sub headers, they would actually be separate articles, but each links back to the parent or the parent concept. Did I get that right.? Pol: Yes. Yeah you totally got it right. For bonus points, now Google will like that, but it’ll also help you as a coach keep your sanity, you may want to have a mini table of contents on that primary article, which would have a link to all of the related articles. So people could jump from the primary one to all the weekly ones, or back to that primary, so just helps a little bit with navigation. Benay: Yeah that’s great. I mean what I really like here is it’s really helping you come up with a strategic content plan and it’s not necessarily rocket science. I mean you could probably map out a year’s worth of content. Well, you’re saying you don’t even need a year’s worth of content, but you know some key things just in that seven days of playing around in ahref. And then you’re done and then go back in I guess, and sign up for the trial again a year later. Pol: Well I mean realistically by the end of the year you’re probably going to want to sign up then for the regular tool and then, because you’ll have seen a lot of rewards in your business, you’re going to have to new leads, new clients and then you may want to monitor your positions more frequently and they’re at least at the time of this recording ninety-seven dollars a month for all the leads that it’s going to bring you, it’s been worthwhile. But you can only do that once you see the results of your investment. Like with that initial trial period. Benay: Got it, OK. Well is there anything else Pol that’s important about constructing this article are you covered the key points that you wanted to share with us today? Pol: Well there’s a few technical aspects. Now most of you probably use WordPress. Pol: That’s what most people use to build their websites at least in the coaching industry. In WordPress. You are able as you’re writing your content to select a header and the header would look something like H1, H2, H3, or paragraph. If you don’t know what that is, you could just Google right no, ‘How to add a header in WordPress,’ and then you’ll find the most relevant resource on that. And what you want to do is that the title of your article should be H1, header level one, then you do not want to have any additional header level one on that page. All of the secondary terms will be H2, heading level 2, and those send signals to Google of the level of importance of your content. It also makes it easy for your readers. And then if you have sub sub points you could go to H3, etc. but really the primary ones are H1 and H2 so that you can deploy this strategy right away. Benay: OK so that’s important to know, because sometimes it might look pretty to have another H1 on your page but that’s going to confuse Google. It sounds like. Pol: Yes, it will, it certainly will. And some other times you may think of just bolding your subtitles. It really needs to be H2 for maximum impact. Benay: OK so that just helps Google I guess troll through it faster and go this is what this is and categorize it. Excellent. OK. Anything else? Pol: Well if you do video, or if you do audio, you can use the same concept to map out your content and then those will be your speaking points when you’re recording your video or your audio. Once that’s done then you can embed it if you want on your page, and then you should add a transcript, and then those speaking points you would make them H2 headers. So you can really deploy the same strategy even if you’re not a writer. Benay: OK. So OK I just want to make sure that I’ve understood this because we do transcripts but I’m not sure we’ve put H1 and H2, so do a video or an audio, transcribe it and then go back and put in those H1 and H2’s in the relevant points in your transcript, even though like in our … this interview it’s not always obvious where those are going to be. Pol: Yeah. That’s exactly the method. And then that way again or just sending the right signals to Google and it’ll make it easier for your audience to follow along because most people today, they scan it page and then with those headers they can know the different topics. And then if they’re interested then they’re going to continue. But if they can’t follow your content they might just leave your website. Benay: Yeah. Great. Great tip. Any more of these? Keep them coming. Is that all you’ve got for us? Pol: Well I think that that’s a good starting point for having your content and then being able to get those leads from Google. But having a lead on your website is not enough, because that’s not a client. So maybe we can go there if you want to? Benay: Yeah well let’s do it. What do you want. Well as long as it’s not too long, is it relatively quick? Pol: Yes. So then on your website what you want to do on that specific page is add your lead magnet. So as a coach you probably have a few…free resource that people can download in exchange for their contact information. And I know that you have some of those, so people can check out your website, Benay, if you want examples and then sign up for that. But you really want to have a way to capture the contact information, and that resource should be related to your topic. Pol: Because really good resources are like checklists, even you can make a pdf version of that article, so people can download it and print it if you don’t have time, or you want to get that up and going quickly. But anything that can really help people put that into action is a great lead magnet. So that way it’s not just a visitor, they have the information they wanted, they leave. Benay: Yeah yeah. So I don’t know if you’ve got it yet with your client, you know that we’ve been talking about as the kind of case study for the remote monitoring, remote viewing. But what did they end up putting on, or have they done it yet? Put this a freebie at the end of their… Of this resource to get people to opt in? Pol: Yes, so we have several resources. And the one that we’re using now is the same across the website and is, at least at the time of this recording, ‘Secrets of the Ancients’ and there is a little bit of mystery to that and that’s what her audience responds to. And then different techniques that they can use to develop their intuitive abilities. Pol: Once People are interested in controlled remote viewing or similar topics, they’re generally interested in that. But that doesn’t mean we’re going to stop there. So then our next step is to create highly targeted lead magnets for very specific articles. Benay: Yeah. Yeah. Great. OK. So that’s some great advice. So we’ve created this amazing asset, this content asset on our site. It’s using a key search word as a title that’s a low difficulty in Google so we’re gonna get this organic traffic to our site. We’re gonna get lots of new people to our site every month. We’ve used the related search terms as the sub headers, the H2’s in that article. We’ve, and then we’ve also added a lead magnet, or in a place that they can opt in get some additional information from us so that we capture their email address. And now they’re there in our coach ecosystem and we can start sending them e-mails and all these other goodies so they can know, like, and trust us, and eventually buy from us. Pol: Yeah that’s a pretty good recap. Benay: Love it. That’s really good. I mean I love how it’s really straightforward. You know what we’re looking for and how to really build a solid asset that’s going to you know, this is like a maybe a week’s worth of work, if that and it can serve us for years to come, which is pretty exciting. Pol: Yeah. And then what you would probably want to do is, again get a maximum return on that. So if you do use social media like Facebook or other platforms, then you could break out little parts of that article and then use that for scheduling your posts and then bring traffic back there, keep them engaged. You can use that for extracts on your email content as well. Or they can even be speaking points if you do webinars, or if you’re going to be doing guest appearances on podcasts or other platforms. So you really want to then find what are the different ways that I can slice and dice that content because you really create an ultimate resource. Benay: Yeah yeah. That’s great. I love being able to reuse, recycle, whatever the word is pieces of assets you know, so that you build them once, you build them brilliantly, and then you can use them in all sorts of ways, across all sorts of platforms. Awesome. OK. Well I think that’s feeling really complete. Is there anything else you wanted to add on this topic before we before we wrap up? Pol: Yes, and only because I’m an extremely detailed person. Benay: I know that about you, Pol. And I love it. Pol: I’m controlling myself. I’m keeping it at a way that people can easily apply it. Benay: You’re doing a great job. Pol: So the last piece would be creating links back from external websites to that article. So that is the authority factor. So let’s say that there’s 10 websites that are making reference to that article on how to learn controlled remote viewing for beginners, then Google will say oh well that must be relevant because there’s 10 people pointing links to it and recommending it. If there’s a hundred people, it’s even more relevant. And that’s generally how the difficulty rating is established. It depends on how many links you have to your resource. So if you’re starting out with your article here, you may as a coach decide to reach out to other people that would add complementary information and then have them do like a little guest section and that could be one of your headers in there. And then by having your information there you can provide a link to their website and generally true reciprocity they’re going to link it back to that article where their advice was featured. So then you’re going to gain a link, that boosts your authority on Google and it could get you traffic from that other person’s website. So you want to think like how could I share this resource with people that will want to promote it. Benay: Yeah. And when Google is looking, is building your authority ranking, or the authority ranking of a piece of content, do they take in consideration shares on social media as well? Or is it just on other websites? Pol: That’s a point of contention. And Google doesn’t fully share the algorithm, and my understanding right now is that yes social media is an important ranking factor, being on YouTube would be another one, I’m not sure about Twitter. I honestly haven’t really examined the correlation between tweets and your ranking. But you, yes you definitely want to be on those networks. And then having even a Facebook page about your website, if It’s not about your specific piece of content you at least want to show that you exist. Google will look at different places, you might be on Yelp for example and you might have reviews there. Well you would want to have your website mentioned there, so that you know that you’re a credible source and you didn’t just appear out of nowhere and no one knows about you. Benay: Yeah. OK. And then coming back to getting you know a specific piece of content on your website linked to by other authorities out there, what are some good strategies? You mentioned one like, so if I if I had an article about something in the coaching world I could go and interview another expert and then that could be a sub 2, an H2 section of my article, and I reference them and then share that back with them and presumably they share it with their audience? Did I hear that correct? That was an option? Pol: Yes. And let’s say that Benay, that you would be publishing an article targeting tools for coaches, or tools for my coaching business, or you know whichever would be the related, the relevant search. Then you could look for people that have complimentary tools and reach out to them and then have them add a little piece in your article about that tool, and then tell them how you shared that and promoted it, with a link to their website. You can give them a screenshot or as URL. They’re gonna want to publish something saying that they’re tool was featured. So that’s that first strategy. Pol: Right. Now the other one is you can look for people that are publishing related content in that space. So using the example of a coaching tools, you may actually be talking to business coaches and they’re not necessarily interested on writing about all the coaching tools but they know that this is something of value to their audience. So then you could propose to write a short article for them to publish on their page about some of the tools, and then ask if it’s possible to link back to your primary article which has a lot more resources for those coaches. Benay: It’s more of a guest post kind of approach. Is that? Benay: OK. A guest post. Yes. OK. Awesome. OK. Are there are there any more like the key strategies or are the guest post and the featuring a complimentary thing in your article, are those the two main ones you’d like to recommend today? Pol: Well the other one could be a podcast interview. Benay: I like doing those. Pol: Because there you can speak about the topic, demonstrate your authority and your expertise. Reach out to a new audience. And then if it’s possible as a resource in the show notes, you could put out a link to some complimentary articles that you wrote on that topic if people want to go deeper. Then that would earn extra links. Benay: Yeah. Cool. OK. Well I think that this is feeling very complete. I think you’ve given us some really simple but highly effective strategies that we can use to actually create content that’s going to help us get leads through Google organically, which I love. I get so excited, I get a lot of those leads already, and I know that I can do even better by adopting even more of these principles, so thank you. I do like to ask every guest what is you know, this is an audience of…my listeners are all coaches, so anything you want, but what’s your number one recommendation for people who are running coaching businesses in today’s environment? Pol: Well I’ll try to keep it on topic because I could go all over the place here. Pol: It would be to build two, or three of those pillar content, those big authority pieces. Because that could give you, like we were saying, content, content for your social media, your e-mails, your interviews, webinars. It doesn’t really matter what medium. It will also position you as an expert in an authority. And then whenever you send emails, you can have that in the signature of your email. So like right now we have it in my e-mail it says… what was it… It says about sales funnel stages and we have like an ultimate article about that. So we say, ‘Looking at increasing your revenue for your online products, your training, or coaching business? Read these articles.’ And then one of them is sales funnel stages, so you would put all of those inside of your signature and then it promotes it. When you’re meeting people that are on the fence, you could say, ‘Oh I actually have a great resource that I think you might be interested in that will help you achieve goal X Y Z.’ And then if they’re interested then you send them a link to that blog post. If you have their mailing address, I’ve done this with great success, you can actually print it and then mail it out to them. And that gives you even more authority. And by having just that on your website, you’re already establishing yourself and in your niche. Benay: Wow. Great advice. Great. I’m like I’m feeling really excited to go and write those two to three pillar pieces. So I’m sure that our listeners are too. Thanks Pol so much. If somebody wants to learn more about you, start to…learn More about your work, Where’s the best place they can go? Benay: Yeah you hit the target, the nail right on the head with that. OK cool. So I’ll include those URL’s in the show notes for anyone who’s interested in learning more about Pol and his work. Well, Pol thank you so much for being on the show today and sharing your wisdom with my audience. Pol: It was really great to be here and I just love to have this opportunity to share with the other coaches and I really think that this is something valuable that is helping our society and helping everyone in their daily lives. And one of my values is to help elevate the quality of life. And I’m really grateful for everyone’s work in that field and for you Benay for offering me this platform. Benay: My absolute pleasure and delight. It’s very much an alignment with my vision too. I love coaching, the whole space, and anything I can do to support our community is definitely me being in alignment with my true values. So, OK thank you listeners for listening to another episode. Please leave us some comments. Ask some questions. And definitely go to Pol’s site and check out thedigitalnavigator.com. All right guys, I’ll see you later. Have a great day and happy coaching. Thank you both for this great interview and the accompanying articles and resources. A well-timed boost for me.